Open Europe has moved. We are revamping and massively upgrading our digital presence to become even better. Enjoy our new website, where it will be easier for you to consume, share and engage. You’ll find our Blog in our new Open Europe Today channel, the go-to source for fast EU analysis. You can subscribe directly to our blog via the RSS feed - our old blog will not be updated anymore, but it will stay where it is for reference. You can cut through the chatter by signing up to The Daily Shakeup (formerly known as the daily press summary) to get the latest developments from across Europe. Our research, proposing solutions to the EU’s most pressing challenges, is now fully accessible on the Open Europe Intelligence channel. 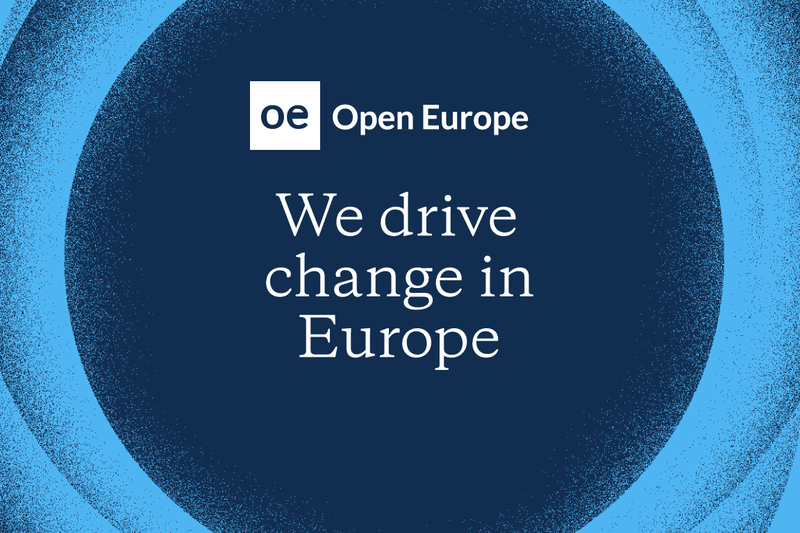 And Open Europe Action is where you can engage with our Events and Campaigns, as we drive change in Europe. Following David Cameron's speech on immigration, much has been made of his comments that the package of measures he proposed to reform EU free movement would require treaty change. In some cases, the speech was ambiguous about what exactly was being proposed. For example, did Cameron really say EU migrants will need a job offer before coming to the UK? This is important because it has legal implications regarding whether some, all, or none of the proposals require treaty change, changes to secondary EU legislation or simply changes to domestic law. Although, politics will of course also play a major part. In addition, some have questioned whether the proposal, outlined by Professor Damian Chalmers and our Research Director Stephen Booth and adopted by Cameron, to limit EU migrants' access to in-work benefits for a certain period of years could be achieved without treaty change, as the authors claim. Today we have published Chalmers' and Booth's assessment of the legal implications of the measures proposed in the Prime Minister's speech and a restatement of the case for why access to in-work benefits can be restricted via amendments to EU legislation rather than a treaty change. Safe to say much of this is legally complex, but below is a summary of a summary of a longer legal note by Professor Damian Chalmers, which you can read in full here. Depending on what is sought this could be achieved under domestic law or amendments to EU legislation but if the objective is a hard and fast residence requirement this could be achieved via amendments to EU legislation rather than Treaty change. This depends on exactly what is proposed. If he meant that any EU citizen must have a job offer before they can come into the UK, this would certainly require Treaty change. In principle, the UK can already do this under its domestic law. EU law only grants a right of residence for more than three months to those who are employed, self-employed, and economically self-sufficient as well as their family members. However, the ECJ has ruled that individuals cannot be expelled as long as they “can provide evidence that they are continuing to seek employment and that they have a genuine chance of being engaged”. While the onus is on the individual to prove this, clarifying what this condition means could be achieved by amending EU legislation. A hard and fast six month deadline would likely require Treaty change. Those deported at the time of conviction can be refused re-entry under existing EU law. Indeed, the German government has said it will use its domestic law to impose re-entry bans of five years for those who commit benefit fraud. The potential difficulty is for those EU citizens with family in the UK, who may be able to appeal deportation under the rights to family life guaranteed by the European Convention on Human Rights. In the case of significant criminal offences where the individual has served a long prison term, the deportation may be several years after the offence, and it is open to the individual to argue that they are a reformed character. This poses difficulties as the individual threat to public policy must be a present threat. Albeit this requirement is currently imposed by an EU Directive, we believe that, if the provision were repealed, there is a strong chance that the ECJ would reinstate it as a Treaty requirement. The UK could use its existing veto over new countries joining the EU to insist on these terms. The news out of Greece has been improving slightly in the past few months in a welcome change from the trend of bleak economic and political news out of the struggling Eurozone state. However, the next few months could see the country reverting to trend somewhat. Eurozone finance ministers agreed yesterday to allow Greece a technical extension of 2 months to its bailout which is due to finish at the end of this year. This is to allow the final quarterly review of the bailout to be completed – a necessary step to ensure the reforms are in place which in turn will allow for release of the final cash payment from the Eurozone. Following the agreement, the Greek government announced that it will hold the first round of its Presidential election on 17 December, moving it up from February. Together these announcements have crystallised some long standing economic and political risks for Greece going into the New Year. However, there are some key questions which spawn from these decisions and also some further risks which remain unanswered, I outline them below. How does the Presidential election work and what is the likely outcome? The President (a largely ceremonial role) is elected by the Greek parliament. In the first or second round the candidate must gain 200 out of 300 votes from MPs. If this is not done then he needs 180 in the third round. If no candidate is found after three rounds, snap general elections are called (these would be around the end of January if they did happen). Currently the New Democracy and Pasok coalition holds 155 seats, while the opposition Syriza party has refused to back a joint candidate (a compromise often used in the past) since it is leading in the polls and wants snap elections. The government today announced former European Commissioner and Greek Foreign Minister Stavros Dimas as its candidate. There is a chance that the government can gain the 180 seats – many of the smaller parties and independent candidates would lose seats to Syriza in a new election and therefore want to avoid having one. Currently, Greek officials put the chance of success at around 50:50 (not exactly inspiring but better than some had expected previously). What questions still need to be answered? It remains unclear exactly how the extension of the bailout will play out. It is assumed the two sides will reach an agreement as before, with Greece eventually pushing through tough reforms. This is probable again but not guaranteed – the room for manoeuvre for the government is limited by the threat of elections. There is only so much they can do without harming their vote share further. Furthermore, the coalition partner Pasok is almost wiped out as a political force and therefore is scrambling for some way to boost its presence. This could lead to radical choices with an election looming. There has also been little progress on exactly how Greece will fund itself for next year. The Eurozone has said it is supportive of granting Greece an precautionary credit line – but this is complicated by a number of factors, not least that it is not very precautionary since it seems almost guaranteed that Greece will need to tap it. Furthermore, the involvement of the IMF remains unclear. Greece harbours significant resentment towards the IMF and wants to move away from their funding, even though they are still due to pay out another €9bn in 2015 and 2016. If they stay, they will need guarantees that Greece will be able to fund itself for 12 months, and if they leave their funding stream will need to be replaced. Was the government right to move up the vote? It is a risky play, but I think it was probably the correct decision (at least from a political perspective). The key reason is that the uncertainty around what comes after the current bailout (which now ends in February) takes some power away from Syriza. The government has proven it can negotiate with the EU/IMF/ECB Troika and has a track record of managing crises. Syriza does not. As we have seen in Greece over the past few years, fear of uncertainty and possible increasing the chance of Grexit once again can be an important factor in peoples’ voting and thinking. Furthermore, the ideal position for Syriza is that a follow on programme would have been negotiated before the vote on the President and potential elections. This would have provided certainty and a platform which Syriza could try to negotiate a new bailout programme and a restructuring of Greece’s debt. One key question which remains unanswered is, what would happen if elections take place and Syriza win? While Syriza claim to support euro membership they want a fundamental change in the way Greece approaches European issues. Notably they want a debt restructuring and a complete overhaul of the programme for reforms and consolidation in Greece which accompanies the bailout (or presumably which would tie into a restructuring). This seems very unlikely to materialise, but it is not clear if they would push for a Greek exit from the euro if their demands are not met or if they would temper their position. All that being said, if this doesn’t pan out, then Greece will face elections early next year, in a climate of serious uncertainty with no clear plan to exit the bailout. Then again, this was always the risk and may always have materialised. 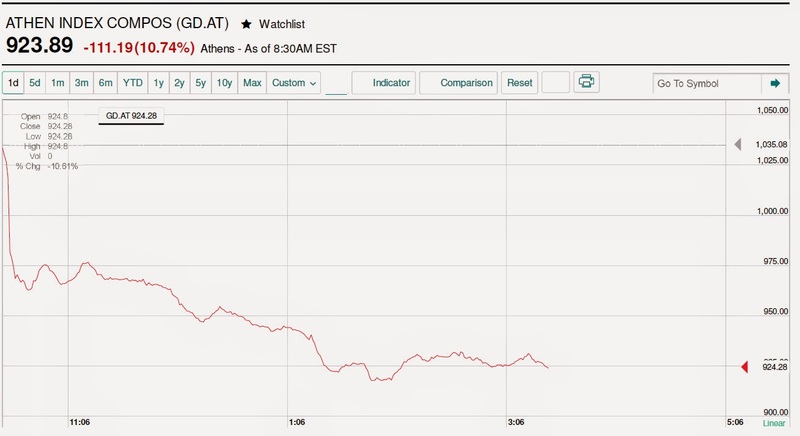 Overall, risks are coalescing in Greece once again. The fundamental questions over how to fund Greece in the medium term (as it economy tries to recover) or how it will continue to deal with incorrect interest rates and a too strong currency have never been answered. The government’s plan to move up the election is a risky one but politically probably the correct option. Ultimately, the next few months will be a bumpy ride for Greece, but the wider Eurozone should not be too affected since it has plenty of buffers in place to deal with such a crisis. “One component - the Internal Ratings-based (IRB) approach for credit risk - was assessed "materially non-compliant" and pertained primarily to the treatment of exposures to SMEs, corporates and sovereigns.” In particular, the report notes that exposures to SMEs are given concessionary risk weightings, presumably to try to encourage this specific type of lending, however it is nonetheless not in line with the rules. Furthermore, it finds that banks are given a significant amount of leeway in how to value their sovereign debt holdings, with most across the EU simply applying zero-risk weighting – again this is a deliberate attempt to limit any distortions to the sensitive Eurozone government debt markets. “Another component was found to be "non-compliant". This relates to the EU's counterparty credit risk framework, which provides an exemption from the Basel framework's credit valuation adjustment (CVA) capital charge for certain derivatives exposures.” Essentially the current rules allow exemptions for instruments which are not traded on exchanges or the wider market and therefore may be hard to value. Furthermore, this “materially boosts bank capital ratios,” though the report accepts that the EU is considering changes to these specific rules. Overall the EU was given the second lowest rating (on a scale of four) of “materially non-compliant”, making it the first jurisdiction to be found on the whole not the be complying with the Basel rules. The assessment is also particularly poor compared to the US, which was found to be “largely compliant” with the rules, in general its failings also seem to be more minor as well as less numerous. The European Commission’s response can be found here, while there is also a response section following the executive summary in the main report. The EC claims the EU’s approach is “particularly ambitious approach, unique in the world”, which is true to an extent given the diverse nature of national banking systems. The response notes that some changes are already in the pipeline, but largely challenges the interpretation which the Basel Committee makes of the rules. On the whole it is not entirely convincing but then, since the Committee cannot force the EU to change, it seems the Commission is largely happy to ‘agree to disagree’ on a number of areas. While all of this may seem rather mundane and technical it does have some important implications. First off, it raises questions about the quality and thoroughness of the recent ECB and European Banking Authority stress tests. We, along with plenty of others, have already raised concerns about this and the report adds further weight to those concerns. Furthermore, the specific problems outlined would certainly have helped present European banks as having higher capital ratios largely by reducing the perceived riskiness of certain assets they hold. A report by Yalman Onaran for Bloomberg earlier this week highlighted the problems relating to the use of banks internal models to weight risk by contrasting this approach to that of using the pure leverage ratio. As the article notes, under the leverage ratio approach 12 large European banks would need to raise a further €66bn in capital. While neither approach is perfect, the Basel Committee’s indictment of the bank’s internal models and the way a large number of exposures in a number of sectors are valued seems to support such analysis and criticisms. The second important implication is that is once again clearly highlights that the EU probably remains the more important level of policy making and legislation than international level or international organisations – at least when it comes to how things are structure on the ground. Despite agreeing to follow the Basel III rules the EU is the one that designs and implements the specific legislation. 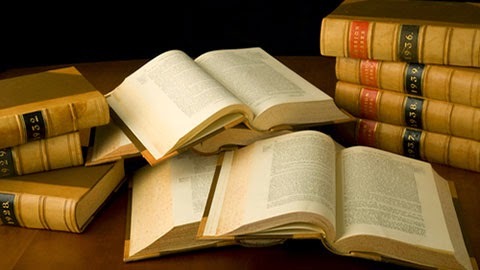 In this case it has clearly altered the rules significantly to suit its own needs – the gap with the original rules as well as how they are interpreted and implemented in other jurisdictions is clear. Furthermore, while the Basel Committee can issue a damning judgement of the EU’s approach, it cannot force it to change. In this relationship all the hard (legal) power lies with the EU. This also extends beyond just implementation to interpretation. Despite writing the Basel III rules the Basel Committee is not even able to guarantee primacy on how they should be interpreted as the EU’s response to the report clearly shows. We warned yesterday that the Swedish government was on the brink of collapse. So it has proved. The Swedish Prime Minister Stefan Löfven today announced snap elections for the 22 March 2015 after the Swedish Parliament refused to back the government’s budget and instead voted for the opposition’s budget. This was largely down to the Sweden Democrats who are playing king-makers in the current parliament. Such political turmoil is alien to the usually placid Swedish political scene and rings more of happenings in struggling Eurozone countries unable to agree on an austerity budget in the midst of a severe economic crisis. Similarly, at the start of the year, the Danish coalition government was weakened by the departure of the Socialist People’s Party (SF) – which was not happy about the sale of part of state energy firm Dong to Goldman Sachs. However, the party said it would continue to support the government from the opposition benches. The move forced Prime Minister Helle Thorning-Schmidt into the seventh cabinet reshuffle since she took office in October 2011. The next general election is due in September 2015, and we wouldn’t be surprised to see the Danish People’s Party become the effective powerbroker – similar to the SD in Sweden – especially after they became the largest party at the European elections earlier this year. We have also noted numerous times (see here and here) that the Finnish economy is struggling and posting some of the worst growth figures in the EU. While it is stabilising now it is finding it hard to source new drivers of economic growth following the decline of Nokia, the tech sector more broadly and the paper industry. The long term economic malaise is surprising in a country which continuously ranks high in measures of competitiveness (4th globally according to the World Economic Forum) and ease of doing business (9th globally according to the World Bank). In the third quarter of this year two of the strongest growing economies in the Eurozone were Spain and Greece. While countries such as Germany, the Netherlands and Belgium barely pulling themselves into positive growth territory the two periphery stalwarts posted some strong figures. Throughout this year we’ve also seen numerous periphery countries getting close to record low borrowing costs, including Ireland, Italy, Spain and Portugal. Discussion over the US-EU free trade deal TTIP have exposed some unusual fault lines. With countries such as Portugal and Italy pushing strongly for the deal to be struck and talking in very free trade terms, Germany and France have been raising concerns and taking a more protectionist stance. 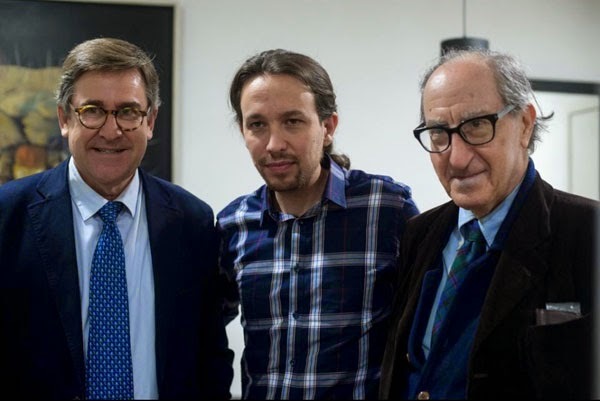 With the next general election only one year away, Spain's anti-establishment party Podemos last week unveiled a revamped package of economic proposals written for them by Spanish economists Vicenç Navarro and Juan Torres López (in the picture with Podemos leader Pablo Iglesias), and called, 'An economic project for the people'. We went through the 68-page document and pulled out the most interesting bits. "It is fundamental that the Spanish government promotes and achieves as soon as possible strategic agreements with [the governments] of other European countries to change the current conditions of governance of the euro." "Flexibilisation" of the EU's Stability and Growth Pact (EU fiscal rules) - although no further details are provided as to what this would involve in practice. "Change the rules that prevent the ECB from financing governments", while establishing a number of conditions under which this can be done. Amend the ECB's statute to include "full employment" among its policy targets. Make the ECB accountable to the European Parliament, which should also be in charge of appointing ECB members. "Create mechanisms that guarantee the pooling of debt and the effective supervision of the financial system at the European level". Scrap the balanced budget rule from the Spanish Constitution - which is basically tantamount to rejecting the EU's 'fiscal compact' on budgetary discipline. Achieve real coordination of economic policies in the Eurozone. "In Spain as in [the rest of] Europe, there is no way to achieve sufficient [economic] recovery unless debt decreases, and debt cannot decrease unless the recovery materialises. The only way out of this vicious circle is an as orderly as possible restructuring of European and Spanish debt. Therefore, the question is not whether one wishes to implement it or not, but rather in what conditions it will happen, because it is materially inevitable that it is implemented sooner or later." Raise the statutory minimum wage. Scrap the labour market reform passed by Mariano Rajoy's centre-right government. Legally enshrine a 35-hour working week. Bring the legal retirement age back to 65 years - although with some flexibility depending on the nature of the job. Increase public spending and challenge "the false idea that in Spain there is an excess of public resources, too many civil servants or public sector employees in the administration, and excessive spending on public goods and services". On the revenue side of public finances, Podemos seems to primarily focus its attention on stepping up the fight against tax evasion and increasing wealth taxation - although the document does mention the need to avoid "any type of unnecessary [public] spending", thereby making budget savings. WHAT'S NOT IN THE PLAN? The idea of a 'basic universal income' for every citizen has been dropped. According to the party's own estimates, the measure would have cost the Spanish government some €145 billion - roughly 14.5% of Spanish GDP. Instead, the new document proposes "emergency plans" to help people at risk of social exclusion. The proposal to hold a 'citizens' audit' of Spanish public debt, potentially leading to a selective default, is also no longer there - and has been replaced by the call for debt restructuring. HOW HAVE THE TWO MAIN TRADITIONAL PARTIES REACTED TO THE PLAN? The day after Podemos unveiled its new economic plan, Spanish Economy Minister Luis de Guindos was asked about it at a press conference. All he said was, "I don't think anyone wants to go back to the [economic] situation we were in three years ago". As regards the Socialist Party, the new leader Pedro Sánchez said, "I'd like [Podemos] to be consistent and not to fall into ideological opportunism", and stressed that Podemos was already "reneging" on some of the proposals included in its European election manifesto (as we noted above). Sánchez also said he's against the 35-hour working week. It is very interesting how Podemos has ditched at least two of its most radical economic proposals. With a view to next year's general election, the move is most certainly aimed at winning over undecided/disappointed voters from the centre of the political spectrum, while also preempting criticism from the two mainstream parties - the ruling centre-right Partido Popular and the Socialist Party - that Podemos is telling fairy-tales to the Spanish electorate because it is pursuing unrealistic policies. For the rest, this revamped economic plan seems to fit perfectly with our description of Podemos as a 'shadow eurosceptic' party: it doesn't openly call for Spain to leave the euro, but many of its proposals are incompatible with Eurozone membership under current terms. Interestingly, many of the proposals actually involve transferring more power and sovereignty to Europe, even over sensitive fiscal issues. The scrutiny this is put under in Spain will be important. It is also not clear exactly how power would be pooled and managed at the Eurozone level under the proposals of Podemos. The Socialist Party has toughened up its anti-austerity rhetoric. The party's new leader, Pedro Sánchez, has himself proposed scrapping the balanced budget rule from the Spanish Constitution - despite voting for it back in 2011. Yesterday, for the first time, the deputy leader of Partido Popular María Dolores de Cospedal admitted in a TV interview that her party would "consider" forming an unprecedented grand coalition with the Socialist Party if it failed to win an absolute majority in next year's elections. This may well be a sign of concern that a left-wing coalition between Podemos and the Socialist Party could force Partido Popular out of power. Everything seems to suggest Spain will be one of the Eurozone countries to watch next year. Polish Europe Minister Rafał Trzaskowski's comments on Monday's Newsnight, where he said David Cameron’s plans to stop EU migrants from claiming benefits for the first four years after they arrive in Britain would be a "red line" for Warsaw, were widely cited in the UK media, much like Polish Ambassador Witold Sobkow's response to our initial report which heavily influenced Cameron's immigration speech. As expected all along, Poland will be the biggest single obstacle to the changes. Some of the reluctance is understandable. Following Poland's accession into the EU after having spent too long on the wrong side of Europe's historic dividing lines, Poles understandably do not want to accept anything that smacks of 'second class' status within the EU. 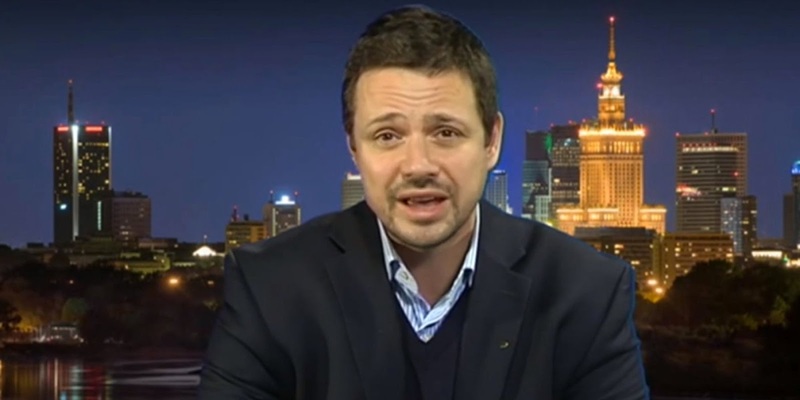 While many Poles may privately think the proposals are reasonable, they also expect their government to stand up for the interests of Poles abroad, and any Polish government will find this hard to sell domestically, including a Law and Justice-led one (the issue has already lead to interesting discussions within the ECR group). 1. These reforms are the best way to let free movement stand: Cameron defended the principle of free movement in his speech and he did not pledge to impose an 'emergency brake' or quotas despite substantial domestic pressure, as to his credit Trzaskowski recognised. This reform package will allow the UK to stay signed up to free movement rules - a key Polish objective. 2. The UK cannot become a contribution-based system overnight: We hear this argument a lot out of Warsaw: "If the UK is concerned that its welfare model is too open, it can re-design it to bring it into line with those on the continent - tomorrow if it so wished. It can be done unilaterally and has nothing to do with the EU." There are several problems with this position. Re-organising the UK's entire welfare system would be an absolutely massive undertaking - politically, economically and administratively. It would basically involve re-writing the UK's entire postwar settlement. This may or may not be desirable, but it simply won't happen any time soon, especially as a result of EU pressure. For one, the UK public won't have it. Cameron could even bat the ball back in Warsaw's court by arguing that "It would be super-easy for you to adopt more ambitious emissions reductions. You just need to replace your dependence on coal with renewable energy, and you're in line with the rest of the EU. It can be done unilaterally and has nothing to do with the EU." 3. The UK shouldn't have to choose between keeping its welfare model and staying in the EU: The logical extension of the argument above is that only a French or Germany style insurance system is compatible with EU membership. Clearly, giving the EU an effective veto over such a sensitive area is not politically sustainable - in addition to being awfully discriminatory against the UK. Changing the rules around in-work benefits on the other hand is a pragmatic way to in effect bring the UK into line with continental systems without challenging the country's entire political order. 4. Poles and other EU migrants in the UK could be worse off under such a system: Ironically, if the UK were to adopt a continental model and scrap in-work benefits and tax credits for low-wage earners entirely, it would hit EU migrants in the UK much harder than the introduction of a temporary qualification period as it would permanently reduce their income. Is this really a more desirable outcome from the perspective of the Polish government and other opponents of Cameron's proposals? 5. Workers on low wages do not contribute significantly to the welfare pot: While the vast majority of EU migrants come to the UK to work and make a positive contribution to the UK economy, as our research showed, workers on low-wages pay very little in income tax and national contributions due to the UK's generous tax free allowance (£10,000 per year and rising) and national insurance contributions threshold (£153 per week). This means that far from funding their own benefits, these workers, especially if they have dependent children, can actually be a net burden on the public purse. Furthermore, despite their misleading name, tax credits in the UK are a cash benefit funded via general public spending and are not correlated to individuals' tax payments. Finally, tone is also vital. Cameron made a big mistake by singling out Poles earlier this year leading to the deterioration in relations as revealed in the leaked Wprost tapes, a mistake which he avoided making again in his immigration speech last week. The rules will apply to everyone from the rest of the EU and not one particular group or country. 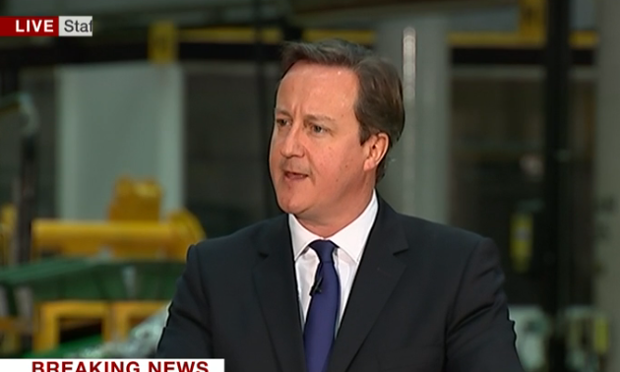 Did David Cameron really say EU migrants will need a job offer before coming to UK? The dust has settled somewhat after Cameron’s much-anticipated immigration speech. As we set out here, we welcomed the balance the Prime Minister struck and were particularly pleased that he co-opted our proposal to let the principle of free movement stand, while limiting access to in-work benefits until after a certain period working in the UK. "So let’s be clear what all of these changes taken together will mean. EU migrants should have a job offer before they come here. UK taxpayers will not support them if they don’t. And once they are in work, they won’t get benefits or social housing from Britain unless they have been here for at least four years." In combination with the "UK taxpayers will not support them" bit, the "should have a job offer" line is much more like an aspiration than a requirement. Indeed, this is the logic of the rest of the speech: Cameron would not have needed to pledge to ask unsuccessful jobseekers to leave after six months if they were to be denied entry in the first place. Admittedly though, Cameron could have been much clearer on the specific point about the need for a job offer prior to entry. The ambiguity in his speech may risk creating false expectations. We will publish a short briefing in the coming days looking at the various legal implications of the proposals set out in the speech. David Cameron was clear that he thought the entire package would require treaty change. However, there are several elements to the speech and the proposals - changing the rules around in-work benefits only one. Here, we are of the view that ours and Professor Damian Chalmers' proposed changes to in-work benefits could be achieved via EU legislation rather than treaty change (we should point out that others disagree). UPDATE (16:30): Anti-immigration Sweden Democrats have just announced that they will vote against the government's draft budget for 2015 and support the opposition's budget instead. As things stand (see our original blog post below), this means the Swedish government would fail to have its budget approved by parliament - and would therefore have to resign. However, it is still possible for Swedish Prime Minister Löfven to buy himself some time and send the draft budget back to the Swedish parliament's Finance Committee - so they can work on a compromise proposal that can draw support from at least part of the opposition. We will keep updating this blog post as news from Sweden comes in. As we’ve noted repeatedly, one of the main themes in European politics these days is vulnerable governments trying to fend off insurgents coming from either side of the political spectrum. Spain, Greece, France, Denmark, Italy, the UK and the Netherlands all suffer from it, albeit at different levels of intensity. The latest victim: Sweden. The country’s anti-immigration party, the Sweden Democrats (Sverigedemokraterna, SD) has gone from 2.8% in the general election eight years ago to 12.9% in this year’s vote. It now holds the third most seats in the country’s Parliament, the Riksdag. As things stand, the centre-left coalition government - the Social Democrats and the Greens - holds 138 of 349 seats. They can draw support from another 21 Left MPs in parliamentary votes - which gives a total of 159 seats. The centre-right opposition (consisting of four parties) has 141 seats. This means that, even with the help of the Left party, the government can’t muster a majority. This leaves the SD - and its 49 MPs - as the undisputed kingmaker in Swedish politics. This dynamic now risks bringing down the Swedish government in a rather spectacular fashion. Tomorrow, the Riksdag is due to vote on the new government’s proposed budget for 2015. As is the practice in Swedish politics, the opposition has tabled a counter-proposal (a 'shadow budget', if you like) which, were things to follow the tradition, it will vote for. Therefore, none of the blocks has an automatic majority - meaning that all eyes are on the SD. The budget vote is a de facto vote of confidence. Prime Minister Stefan Löfven has made it clear that he will resign if he fails to get the government's budget through. The SD are currently weighing up their options. If they decide to back the opposition's budget, they will effectively be forcing the government out. The SD decide to abstain, meaning that the government's budget will pass with a relative majority. The SD announce their intention to vote for the opposition's budget. The government postpones the vote and sends the draft budget back to the Swedish parliament's Finance Committee in a bid to come up with a new proposal that can draw support from the centre-right opposition. The SD decide to vote for the opposition's budget but, in an unprecedented move, the opposition votes with the government and the government's budget goes through. The SD decide to vote for the opposition's budget and the opposition's budget goes through - leading to Prime Minister Löfven resigning after only two months in office and, potentially, to snap elections. In other words, an almighty mess. Swedish politics have simultaneously become Italian (turbulence) and Dutch (fragmentation of the centre). Such dynamic was unthinkable only a few years ago. Löfven’s greatest hope is that the SD blink. Bringing down a government and triggering a snap election is far from a risk-free strategy. In 2012, Geert Wilders and his Freedom Party withdrew support from the minority centre-right Dutch government in a budget vote. In the subsequent snap elections, Wilders got absolutely hammered and his party’s share of the vote was halved. He had over-reached and Dutch voters disapproved of what they saw as reckless behaviour. Also, do the SD have the energy and financial power to fight another election? 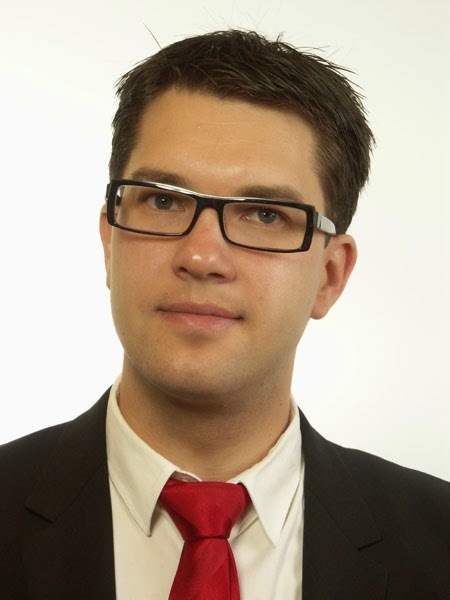 Quite literally: the party's leader, the scarily able Jimmie Åkesson (in the picture), has taken indefinite sick leave due to exhaustion. The SD would potentially have to fight a new election without its greatest asset. As our Director Mats Persson argued in the Telegraph last week, it’s interesting to note the diametrically opposite approaches in the UK and Sweden in response to insurgent parties. In the former, it’s been a case of out-Ukipping UKIP - at least up until Cameron’s immigration speech last week, in which he drew a clear line in the sand. In the latter, it’s been a case of ignoring and seeking to humiliate SD - fuelled by a media seeing itself as the guardian of Swedish tolerance. Neither approach has worked. This is part of a very complex discussion of course. But ahead of tomorrow’s vote, Swedish politicians and commentators would do well in thinking about how they reached a point where an anti-immigration party with neo-fascist roots became so powerful that it can take governments down? At least Swedish politics is no longer un-exciting. Nicolas Sarkozy took a further step on the road to his political comeback over the weekend, as he won back the leadership of France’s centre-right UMP party. The former French President secured 64.5% of votes in an online survey of UMP members, finishing well ahead of former Agriculture Minister Bruno Le Maire (29.2%) and outsider Hervé Mariton (6.3%). The UMP will change name before the next round of local elections in March 2015. He will set up a committee of former UMP prime ministers to help him manage the party – although the idea has reportedly not gone down particularly well with François Fillon, one of the former prime ministers supposed to sit on this committee. On this blog, we have noted how Sarkozy’s political comeback has the potential to really spice up the French debate over Europe. The former French President has this year repeatedly spoken of returning half of the EU’s powers to national governments. He also wants to scrap the EU’s passport-free Schengen travel area in its current form and replace it with a more selective ‘Schengen II’, which could only be joined by countries adopting the same immigration policies. Sarkozy’s political strategy looks pretty clear: take a tougher, more ‘realist’ stance on Europe and immigration to stop the UMP losing voters to Marine Le Pen’s Front National. What is far from clear at this stage, though, is whether the new line will draw unanimous support from the rest of Sarkozy’s party. Another important point to keep in mind is that the victory in Saturday’s party leadership poll does not automatically make Sarkozy the centre-right candidate for the 2017 French presidential election. A separate ‘primary election’ is due in 2016, when Sarkozy is going to face at least one much tougher rival: former French Foreign Minister Alain Juppé. How that duel will end is anyone’s guess, but recent opinion polls suggest that Juppé would have a better chance of victory in case of an ‘open primary’ – where members of smaller centrist parties can vote alongside with UMP members to elect a single centre-right presidential candidate. 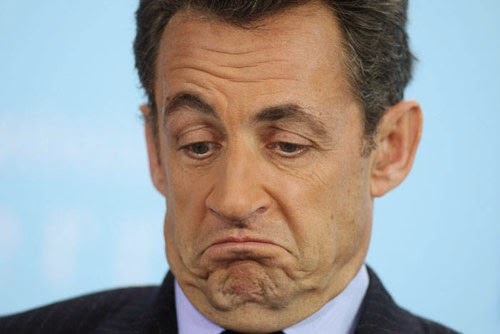 Sarkozy has so far spoken in favour of an ‘open primary’, although he looks reluctant to involve the Democratic Movement (MoDem) in the exercise. The centrist party led by François Bayrou actually endorsed François Hollande in the run-off of the 2012 presidential election against Sarkozy, and Bayrou has made no secret of his support for Juppé as the centre-right candidate in 2017. Finally, Sarkozy remains (directly or indirectly) involved in a series of pending legal cases that may well dog his campaign. The road to 2017 is still very long. What impact will Cameron’s EU free movement changes actually have on the ground? We’ve laid it out in our response today, but in an attempt to elucidate things we’ll go into a bit more detail in this post. In addition to the general 'fairness' discussion - making sure that there's a link between what people put in and what they take out - the debate is now centred on the practical impact of the proposals. In a twitter discussion we had last week with Michael O’Connor and Jonathan Portes on the number of EU migrants effected by these sorts of curbs, they seem to claim that around 10% of "Eastern Europeans" will be affected. The conclusion they seem to draw is that the proposal won't make that much of a difference. 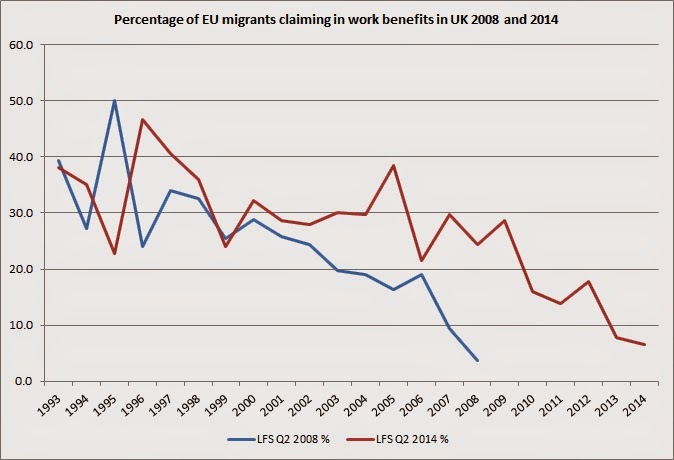 To reach that figure they seem to simply take the percentage of Eastern European's claiming benefits in 2013 - it does not seem to be based off the data over four years or compared over time to see if this snapshot is representative. The data available is unfortunately pretty bad, but there's enough data to look over time, rather than a single year. As we have laid out in our response today, we think these measures will hit between 14% and 16% of total EU migrants - one in seven EU migrants. This is shown in the table above and taken from the average of the final four years percentages in the graph below. As we have noted before, its obvious and logical that the longer migrants stay in the UK the more benefits they claim (as they have more children etc) - but from that it's hard to draw the conclusion that the impact is insignificant. As a share of gross flows (shown in graph below) this will likely impact around 100,000 people over the four year period. This is based on flows from the four years before 2008 and 2014. Is this a significant impact? Depends on what you want to achieve. If you want to end free movement, it's not. If you want to put a cap on free movement, it's not enough either. That's not what we want, however - we think free movement should stand. That's the point. If, however, you want to target the one area that seems to be of the most concern to the UK with respect to EU migration - the low-wage sector - then 100,000 over four years matters. This number will be largely at the low-wage end of the labour market - since these are the workers that claim significant amounts of in work benefits. In other words, as we've said all along, this is a targeted policy, intended to take away the de facto taxpayer-backed subsidy to perform low-paid jobs which does not exist in most other EU countries. It's impossible to put a firm number on how many people will decide not to come due to this measure. We've provided plenty of figures showing how this would take away the incentive in many cases to move from a minimum or an average wage in some parts of Europe to a minimum wage in UK, using in-work benefits as effective top-up, in turn making the move financially attractive in the first place. In other cases the de facto income gap between the sending state and the UK will be massively reduced. Taken together, and as anyone who has moved across borders will know, changes in the cost of living in the country of destination will feature in any decision to make the move in the first place. Perhaps not in a detailed spreadsheet kind of way, but it does clearly feature. The volume dimension is one part of the the package - and it shouldn't be over-stated. However, it certainly shouldn't be under-stated either. Unless, of course, you want to end free movement. The big speech has been delivered - you can read our response here, but below we round up the reactions from around Europe - remember, the changes Cameron set out today based on Open Europe's research will require agreement from other EU leaders. "These are UK ideas and they are part of the debate. They will have to be discussed without drama and should be discussed calmly and carefully." This is a welcome shift from the dark days of Viviane Reding and Laszlo Andor. Spiegel online goes with “Demands to Brussels: Cameron blackmails the EU”, ARD’s headline is “Cameron's demands: EU membership is only conditional”, Focus titles their article “With these demands Cameron blackmails the EU”. This list could easily be continued -the actual substance of Cameron’s speech has been crowded out in most parts of the German media landscape. We suspect that might change though when it becomes clearer that Cameron may just have saved free movement. "Poland will not agree to changes undermining the principles of the EU's single market, specifically the free movement of people... which should as such be maintained in its current form." "Cameron's plan will definitely not pass in its entirety at the ECJ. But this will already be after the UK elections. Weak response by the Commission." The response by the Czech Europe Minister Tomas Prouza is the toughest we've seen so far - he suggested that Cameron wanted to tax people differently according to their nationality - even though tax credits is a cash subsidy and are not correlated to tax paid. He also tweeted a picture of Czech WWII pilots who fought in the RAF pointing out that they hadn't "worked" in the UK for over 4 years. David Cameron's 'immigration speech' is expected to take place very soon. As we have noted several times, one of the options that he potentially could go for is an "emergency brake" - the ability to impose temporary restrictions on the number of EU migrants who come to the UK. We can see why this would be appealing politically - but we fear that if Cameron does announce something like this, without having a clear vision for how it would work exactly in practice, it could turn into another net immigration target. Sounding very good in an election manifesto - but ineffective in practice. An emergency brake would be targeted at flows of new EU migrants not the existing stocks. UK Ministers have previously spoken about the need to manage “destabilising flows” – however, this remains a vague term that could mean many different things. 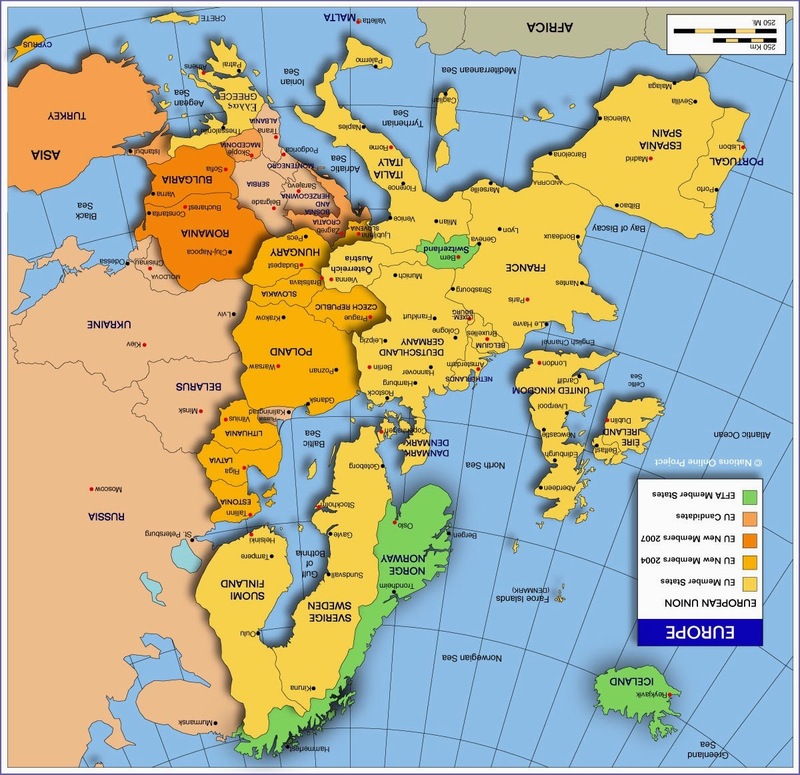 Pinning down what would constitute a destabilising flow could prove incredibly tricky. For example, the graph below shows that current flows are not proportionately higher than previous flows and remain small as a share of the workforce (relevant for their impact on wages). In general, if the bar is too high, the mechanism will never be used. If too low, the brake would become a long-term rather than temporary measure – a de facto limit – and be tremendously hard to negotiate in Europe. It is very difficult to codify objective criteria for pulling an emergency brake – particularly any that apply to the UK’s current situation. The UK economy is booming, unemployment is falling, EU migrants have high employment rates and the UK takes less EU migrants per head than several other EU member states. All these most obvious criteria won't work for the UK. It's hard to claim to be the best performing economy in Europe and simultaneously claim to have a 'crisis' so bad that special treatment is required. It would also be impossible to predict all the future challenges migration could pose. Possibly the most compelling argument the UK could use at the current time is that certain local areas are facing high pressures on public services and housing supply. However, restricting EU migration to certain areas of the UK would be very difficult to administer in practice, while national restrictions would be a disproportionate response to local problems. The impact of migrants is also hard to discern in exact terms given other domestic policies regarding housing and local services. What the UK would effectively be asking for is a ‘time out’ from EU migration – which is largely a result of understandable political pressures. However, this necessarily makes the criteria for pulling the ‘emergency brake’ politically arbitrary – and in turn tougher to negotiate in Europe. There's not a government in Europe, it now seems, that doesn't have a populist challenge. Should Spain be granted dispensation too? It's also difficult to sell at home. There are precedents in EU law for restricting either free movement of persons or the other EU freedoms. So in that sense, an emergency brake wouldn't be completely out of character for the EU. All of the existing 'brakes', however, are policed by the European Commission and the European Court of Justice – would a domestic audience be happy with such an arrangement? Furthermore, at the very best the brake is likely to be temporary and may only delay flows rather than actually reduce them. It would have to be activated for a very long time in order for it to really reduce net flows in the long-term. In addition, if ‘cost of living’ is to be cited as a reason for pulling the emergency brake, it means accepting that there is a ‘cost of living crisis’ – a move that would any UK Government would be politically loathed to make in public. If someone can come up with a criteria for how to capture all the potential variables, then we're open to suggestions. But it would be foolish to announce such a big policy on such loose grounds. As we've argued repeatedly, writing the headline first, and the policy later, rarely works. 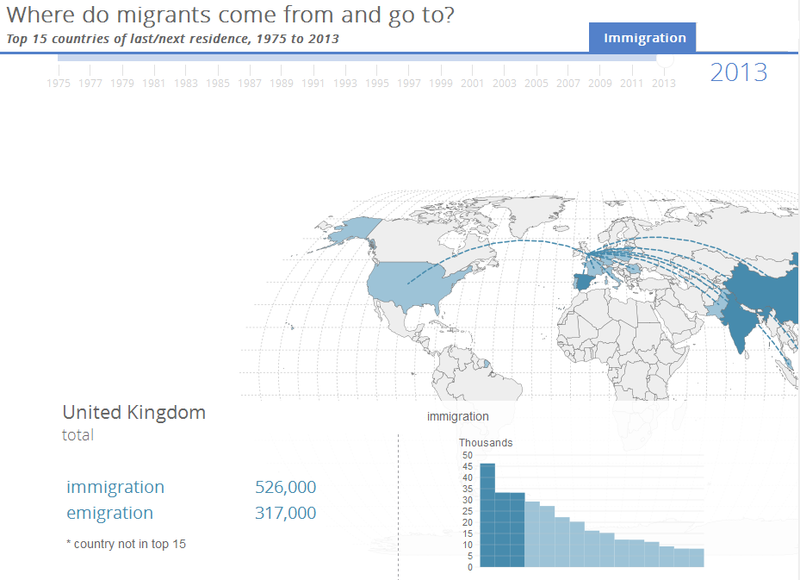 Where do migrants to the UK come from the EU or non EU? David Cameron's hopes of getting back on the front foot on migration have been dealt a blow this morning - ONS figures show that immigration is up, and specifically immigration from the EU is up as well. Total net long-term migration estimated to be 260,000 in the year ending June 2014 up from 182,000 in the previous 12 months. Total gross immigration of 583,000 in the year ending June 2014, a statistically significant increase from 502,000 in the previous 12 months. 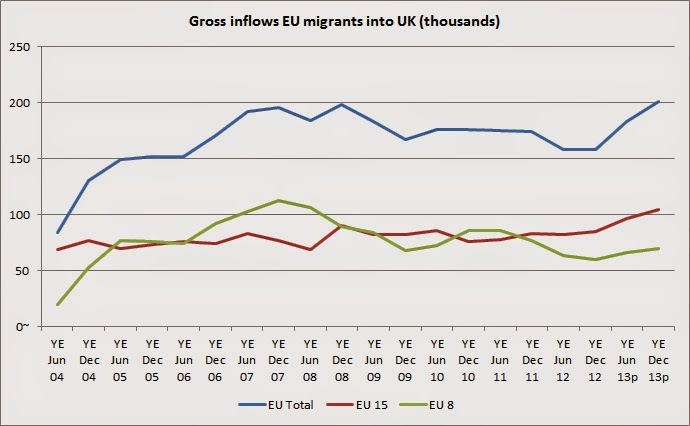 EU immigration up 45,000 and non-EU up 30,000. 32,000 Romanians and Bulgarians came to the UK up 11,000 and EU15 migration also up 10,000. Estimated employment of EU nationals resident in the UK was 16% higher in July to September 2014 compared to the same quarter in 2013. Interestingly, while immigration is also up from the new EU member states, the longer term trend driving EU migration is that from the EU15. So how will all this play out? 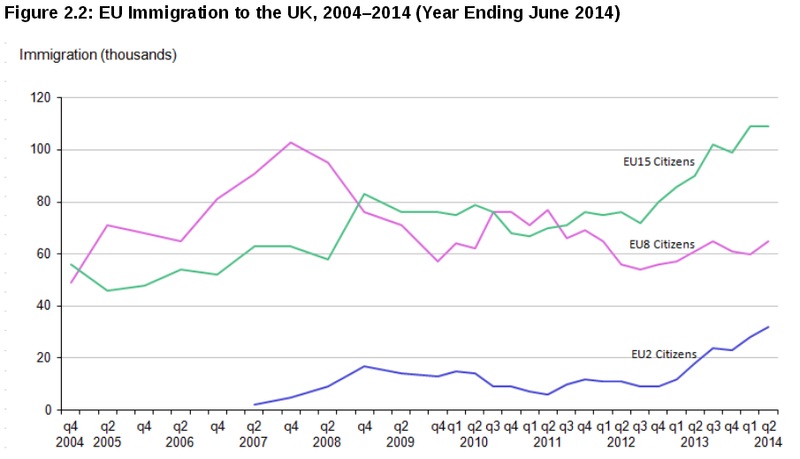 Well as you can see from the ONS graph below EU migration is not the largest component in total UK migration. 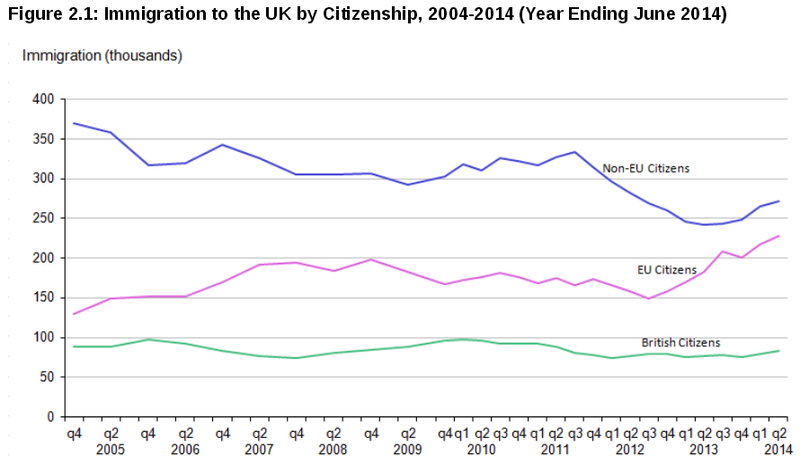 That non-EU migration also went up for the first time in a while is politically significant. 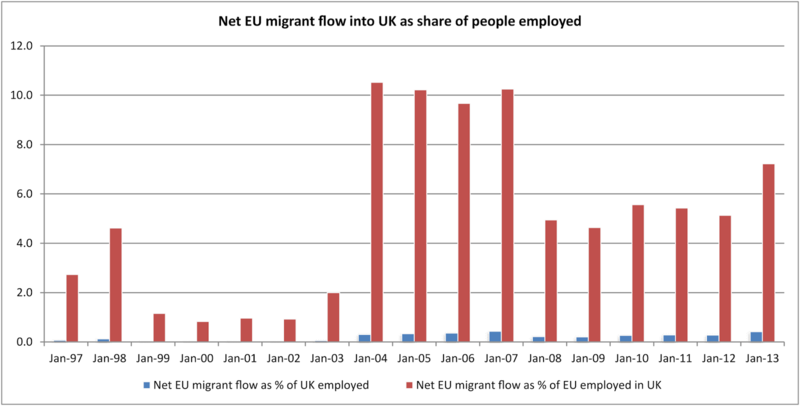 However, EU migration is a large portion. The fact it is not showing any sign of decreasing will fuel trust issues over both the EU and migration. Has the Tory leadership already ‘priced in’ today’s figures, or has this made a cap of some sort more likely?